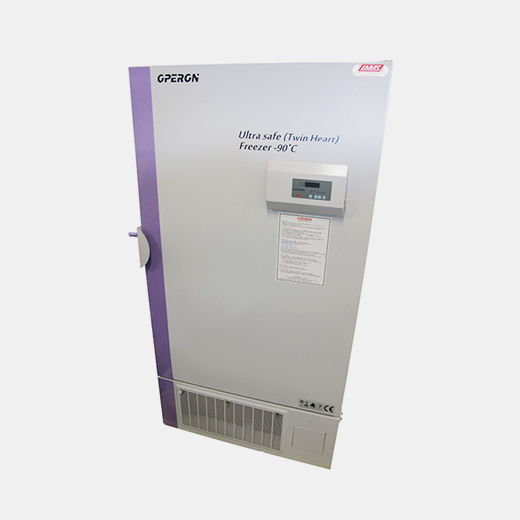 731L Ultra Safe Twin Heart Ultra Low Temperature Freezer. The twin Heart system operates down to -90°C. Application of patent is pending for the Single Stage Auto Cascade Two compressor systems. With this system if either compressors fails, the second compressor maintains -80°C (with ambient. +25°C/ +32°C). Keeping your samples safe. The Twin Heart System unique refrigeration system allows for electrical/mechanical disconnect/reconnect without interruption to operation. The replacement compressor is a complete self-contained drop in unit. The end user can exchange the compressor within 30 minutes without trained engineers or special tools, Vacuum pump, welding equipment, extra gas. Down time and repair costs can be reduced by 30~70% compared to conventional refrigeration systems. Send us an enquiry via the button below to order this freezer on sale, while stocks last.